This is the second part in my glittery gothic adventures, part one talks about the bodice and can be read here! Since I didn’t have very many flowers I decided to make this skirt a half circle instead of a three quarter circle (like my previous flower dresses). Looking back on it I regret this because it didn’t create a very nice silhouette, this type of dress really works better with a fuller skirt! 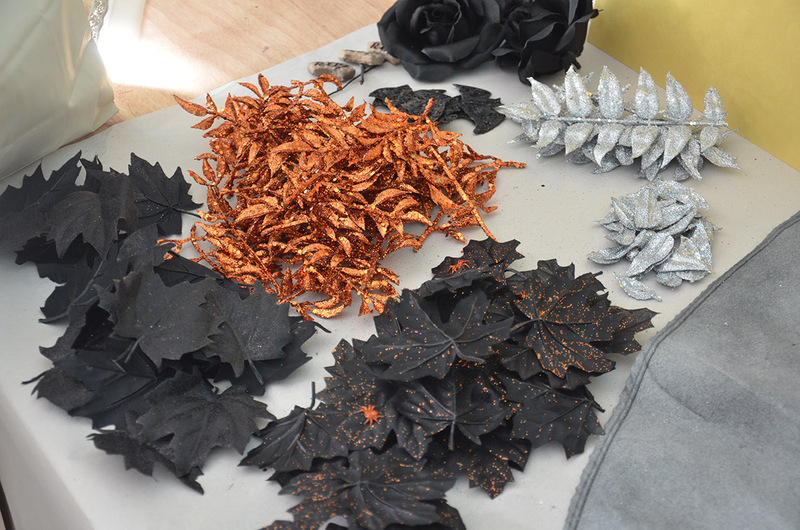 I cut the pattern from black broadcloth, but since all my flowers were black they didn’t really pop against the fabric, they blended in and looked terrible. 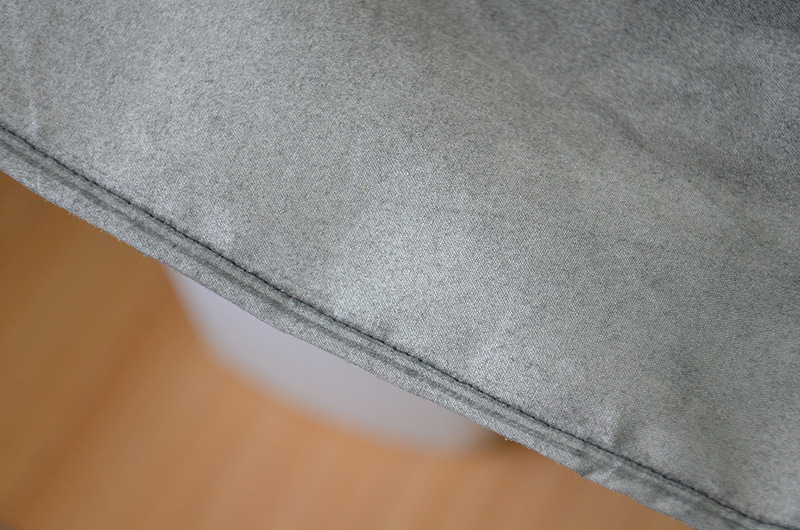 My solution was spray painting the hem silver to get a grey foggy effect. 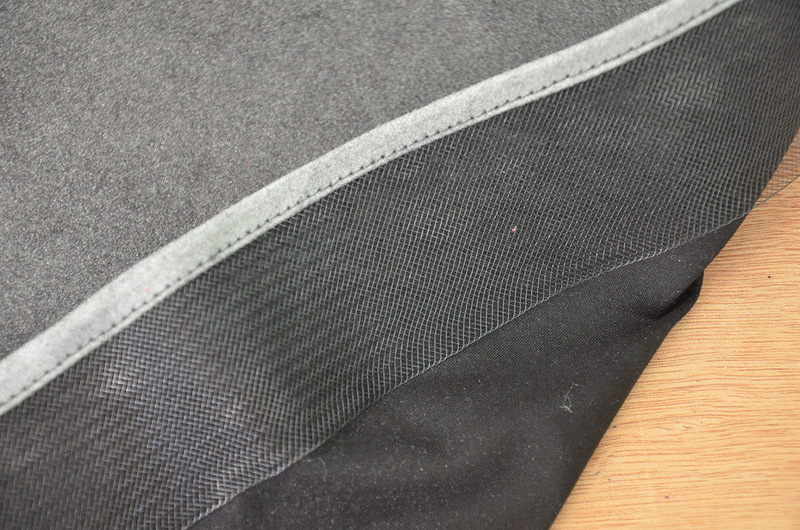 I think it worked really nicely, it looks interesting but keeps with the spooky/black theme, which normal grey fabric wouldn’t. Even though I was happy with the paint job on the skirt I had no clue what direction to take this project in. 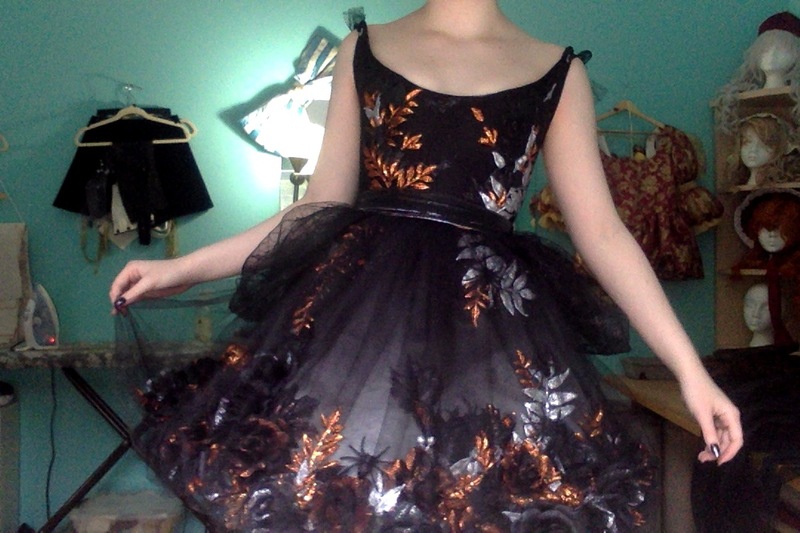 It sat on my dress form for several days looking like this and I debated about scrapping the idea and giving up. 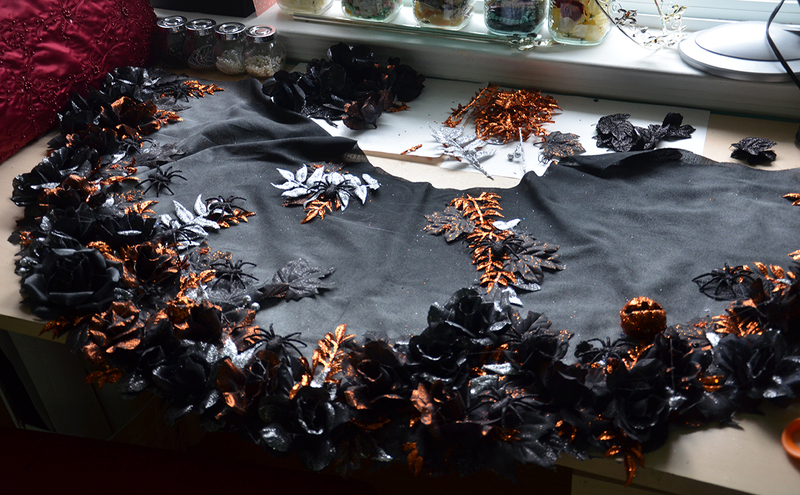 Part of the problem was the bat wing bodice (which was a huge failure) but just in general I wasn’t sure how to arrange the flowers and decorations in a way that wouldn’t look silly. My attempts with pinning things on to get a feel for how they would look just made things worse since it looked so bad. I still wanted to move forward with this project so I decided to dive in and hope for the best. Just because one or two flowers looked bad doesn’t mean twenty will…or so I hoped! 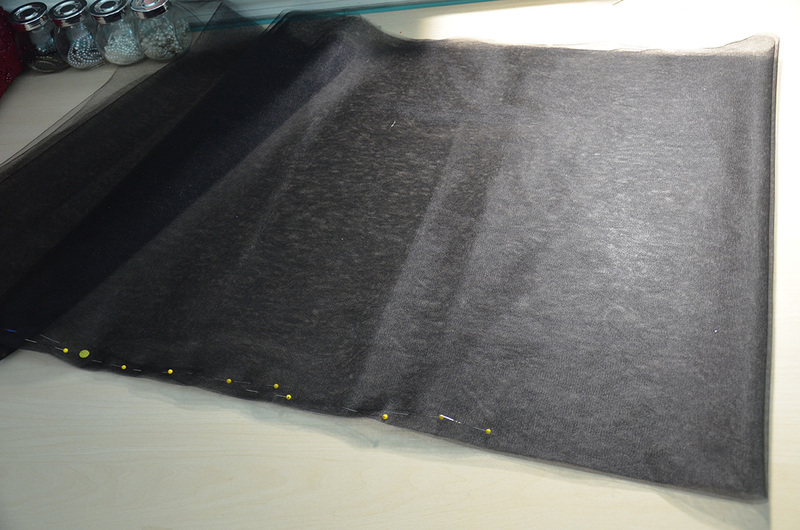 Step one was hemming it, I used black two inch horsehair braid to add a bit of lift to the skirt. My sewing machine foot left tracks in the paint which was weird since I left it to dry for several days! The skirt totally retaliated by getting paint all over my hand and machine. I really wouldn’t recommend the whole spray painting fabric method because the paint seems to stick to everything else rather then the fabric, and it’s tough to get off. Then it was time for flowers. Despite my worries I was really excited about this, everything was so sparkly it was hard not to feel giddy! I arranged this all on a table because I knew if I tried to do this on my rug I would never get all the glitter off. Then I started gluing stuff on. It took me a while to get the hang of it, working with flowers that were all the same color was a bigger challenge than I had expected, but in a fun way. I had to pay more attention and plan things out a bit more to get them to look the way I wanted. Here is what it looked like with all the flowers added! I’m really happy with it. It isn’t quite what I had imagined but I think it came together really nicely, it’s tacky but not in a really obnoxious way, which is impressive considering the materials I was working with! 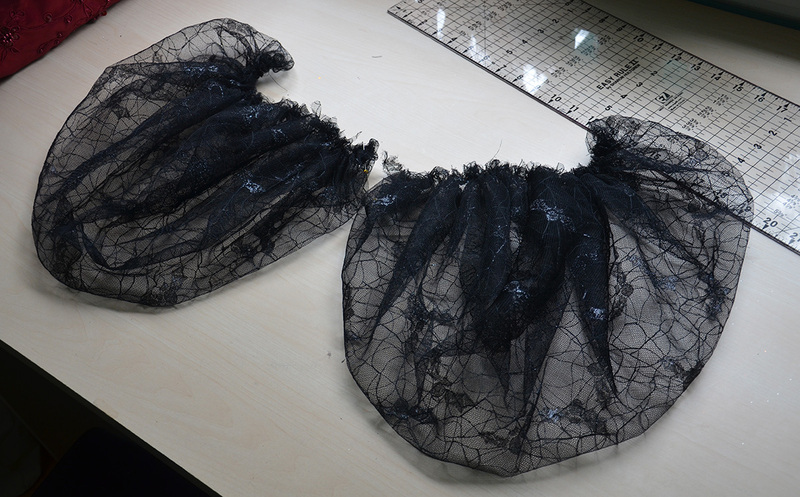 Then it was time for tulle. I used a piece that was five yards wide and twice as long as the waist-to-hem measurement of the skirt. 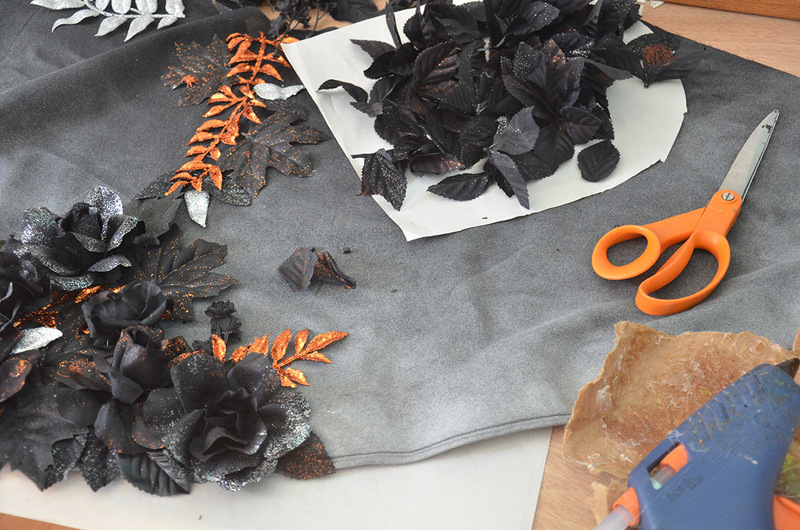 Once it was cut out I gathered each edge and secured them at the waist of the skirt. 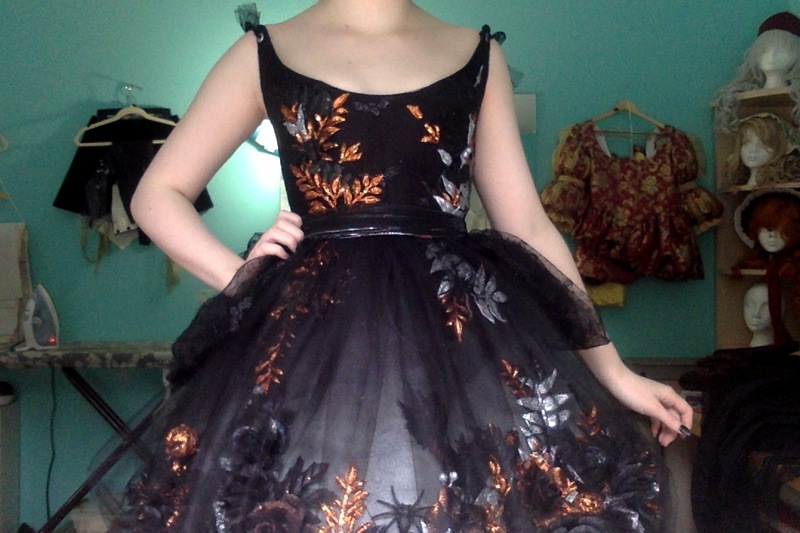 Here is what it looks like with all the tulle sewn on! But the skirt still wasn’t finished. Though I really liked how it was decorated the silhouette still wasn’t very nice. It looked too small and sad. To try and oomf it up a bit (that’s a technical term) I decided to add gathered pieces of bat material. Doesn’t that sound like a fantastic idea? 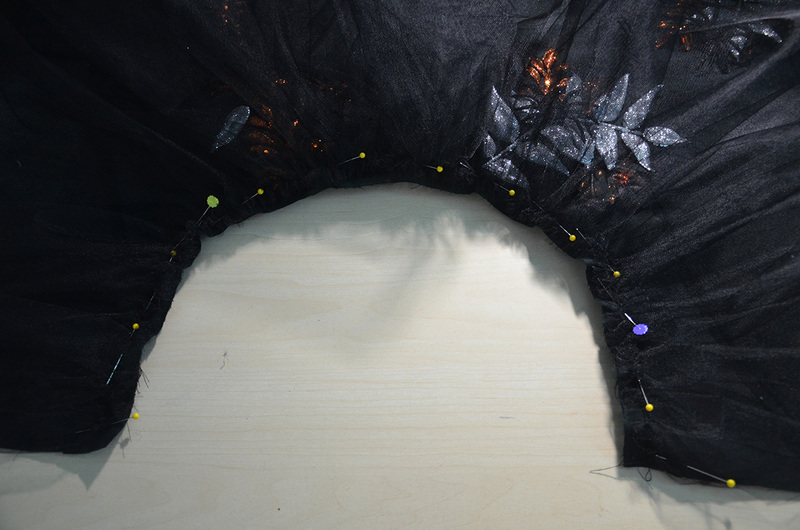 This would add more volume on the sides of the skirt without covering any of the decorations . 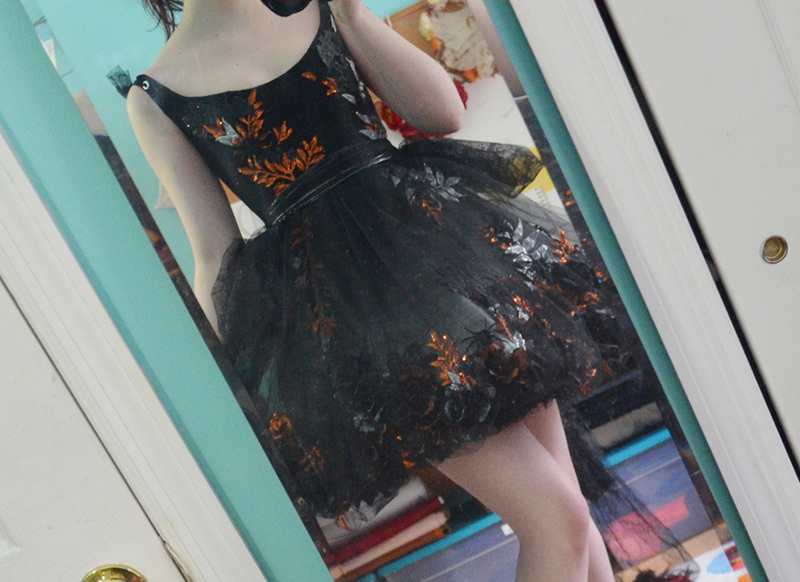 It also helped blend the skirt and bodice together since the bodice has a bat fabric overlay but the skirt does not. 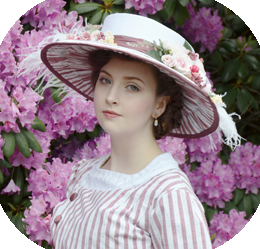 Plus I can say it’s super loosely inspired by panniers which go nicely with my stay inspired bodice shape. 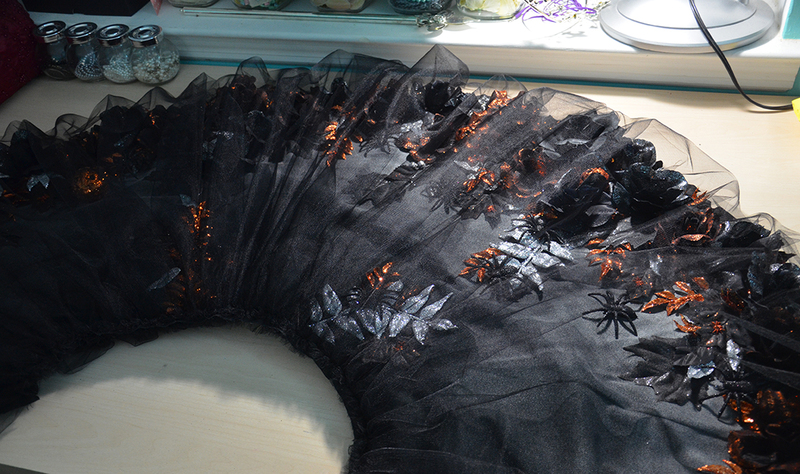 To make these I had to steal fabric from my failed Morticia costume, which I made last year around this time. 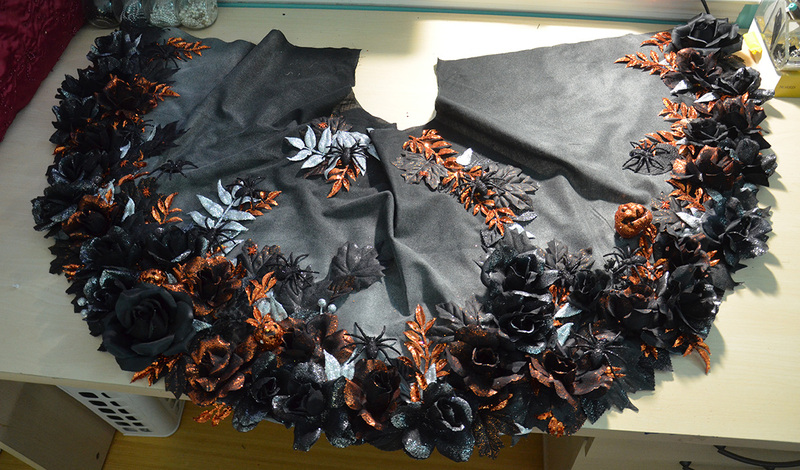 The fabric was actually cut and sewn into the skirt as godets and seam ripping them out was a huge pain! They were already cut into diamonds, which made triangles when they were folded in half. I didn’t want to make them any smaller so I decided to leave them in this shape and gather the tops down. I sewed those onto the waist of the skirt, then sewed the bodice to the skirt. 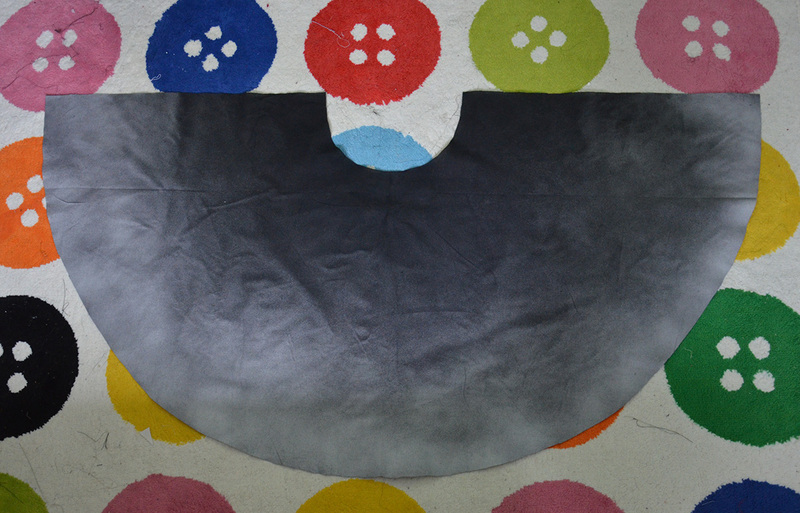 The skirt got sewn up the back and it was done! 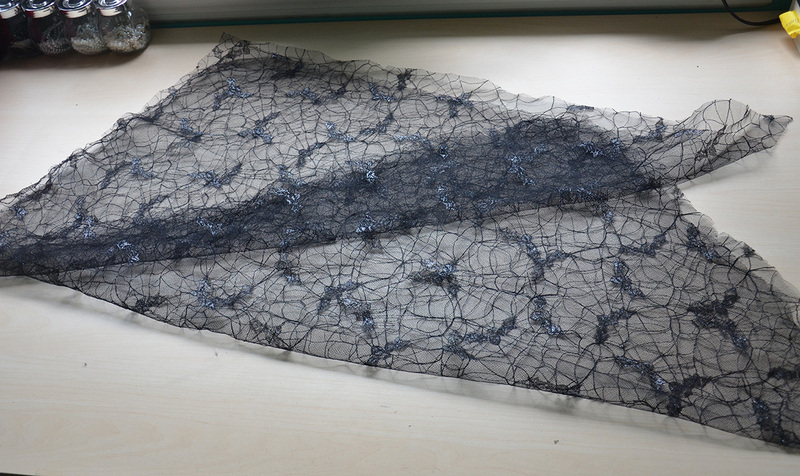 On and I paired it with a sash made from iridescent black/silver mesh. I like these photos since they were taken in front of a window and you can see the glitter! 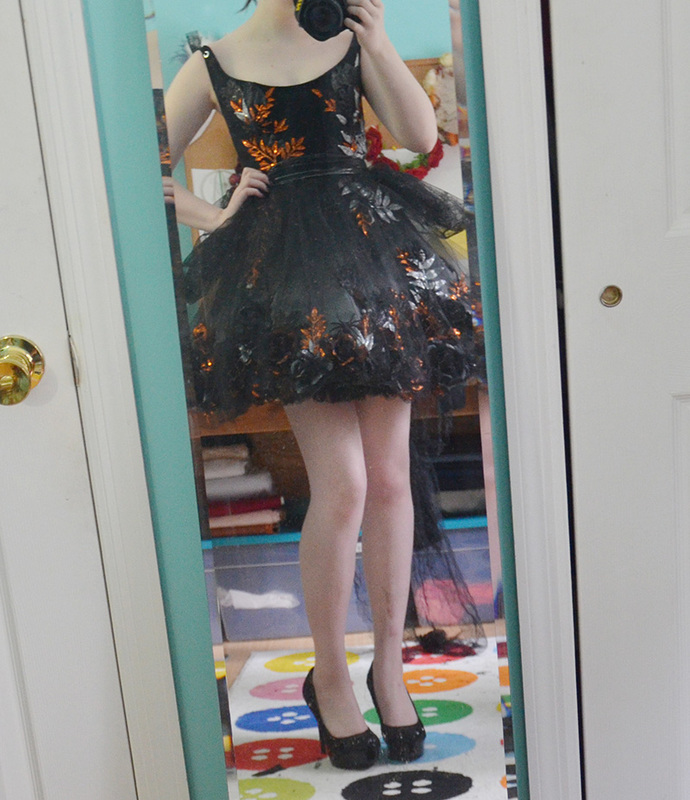 And here are some poor mirror shots that show it full length. That’s about it for this costume! I also made a headpiece and necklace but I didn’t take many (any) photos of the process. I will have a video tutorial about them so maybe i’ll post a link whenever I get it uploaded. And I tried to get photos of the whole ensemble but everything went wrong and after three hours I was left with zero usable photos. Tomorrow i’m going to try again and hopefully get some better shots to show it all together! as a future-crazy-lady-who-goes-all-out-decorating-the-house-in-October, this is really beautiful especially considering you don’t like Halloween! it works perfectly for the season without being tacky. I also didn’t know you could do a rolled hem on a boned bodice, so that’s great to know for the future. 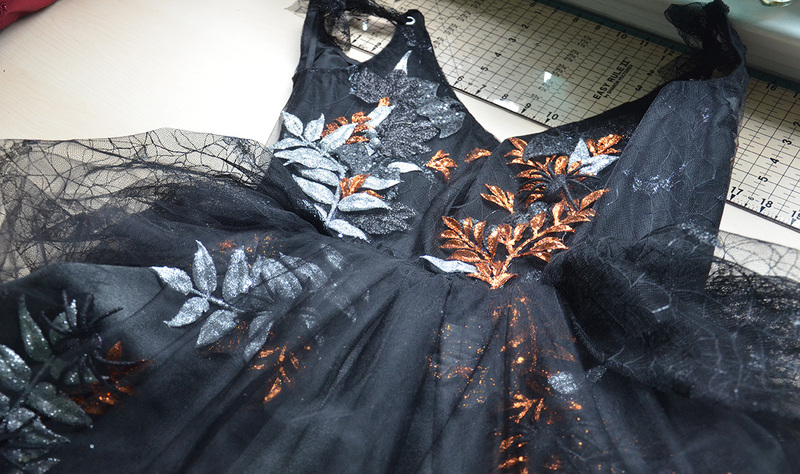 This is a dazzling holiday dress! Wonderful work! This is amazing, adding the gathered material worked so well, it definitely has more “oomf”! 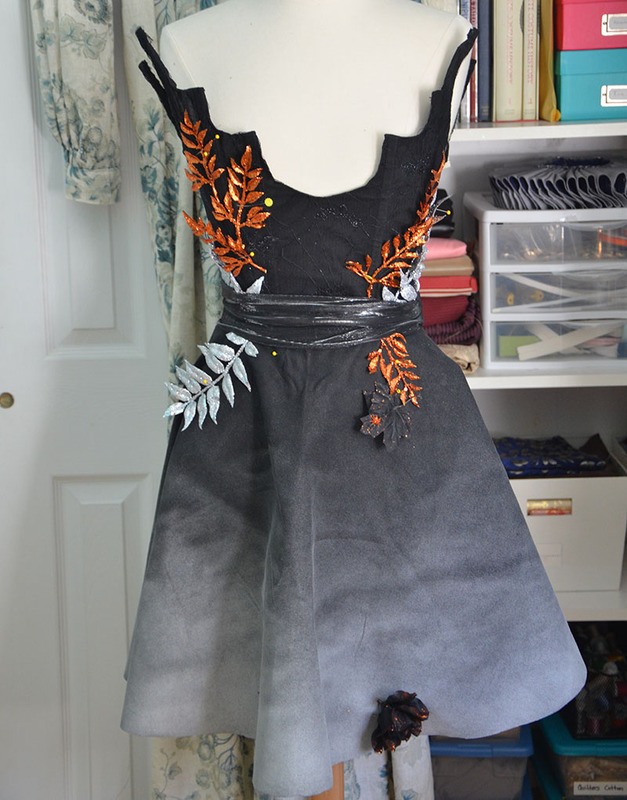 I went to a costume school and everytime I see your work, you make me feel bad about myself. Wow, you did a fantastic job with your materials. Even though I am a sewer myself, I couldn’t have created an outfit that is even half as beautiful as yours. 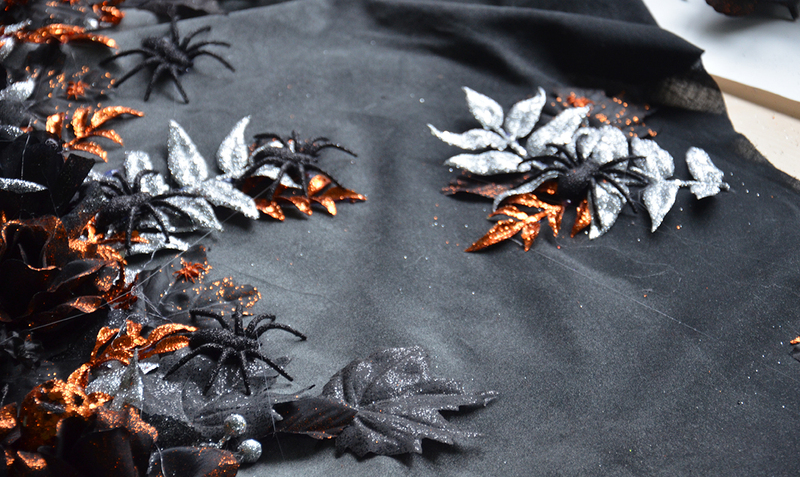 It must have took you forever to get the skirt’s leaves, flowers and spiders placed right. So kudos to you and you inspire me with your creativity. Oh. my. goodness. I’m in love with this dress. It’s so pretty. I would just wear it around the house, feeling pretty all the time! I love the finished product! You did an amazing job. Your spray paint is probably rubbing off because of the material you used. You said that broadcloth was a cheap material, and especially on synthetics, spray paint can sort of start breaking the material down. This will cause some of the pigment to rub off. This happened to me once when I tried to paint a pair of plastic goggles for cosplay. Hope this helps! I love the costume. Your imagination is quite amazing and your skills are fantastic!